PepsiCo Educates Dietitians on Sodium? This is what happens when the food industry attempts to educate health professionals. 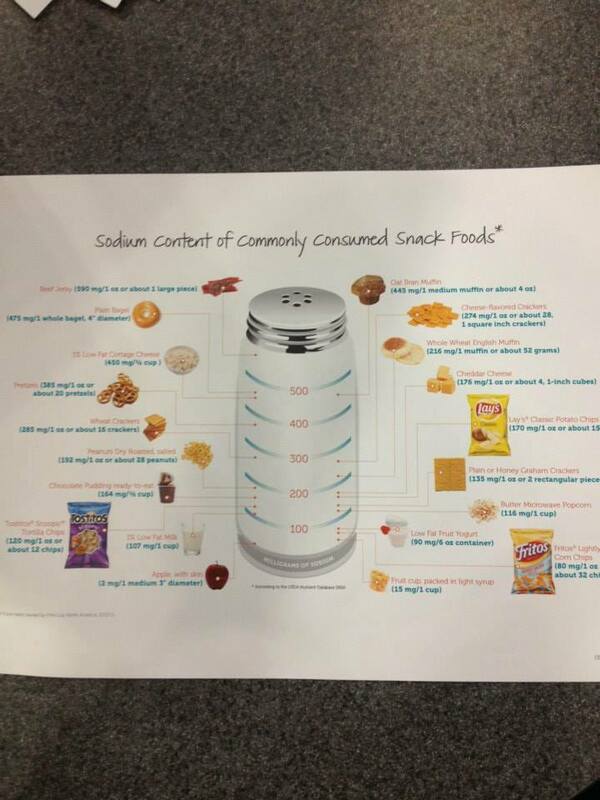 This handout from Frito-Lay (a division of Academy of Nutrition and Dietetics premier partner PepsiCo) is always available at the Academy’s annual conference, and it tries to make the case that Frito-Lay snacks are a superior choice based on the fact that they offer less sodium than beef jerky, crackers, puddings, bagels, and muffins. Notice the absence of other common snack foods — like nuts, seeds, and vegetables, all of which are low in sodium. Note, too, how an apple appears in the “under 100 mg of sodium per serving” category, along with a bag of Lightly Salted Fritos. PepsiCo banks on the fact that handing out this sort of “literature” at a nutrition conference can result in dietitians passing this on to clients and patients. It gets particularly comical when Frito-Lay criticizes cottage cheese and yogurt in its “educational materials,” while the Dairy Council puts these same foods on a pedestal.